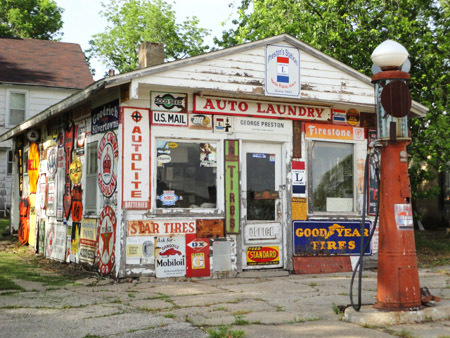 An auction is set for Saturday, August 11, 2012 at 9 am for highway memorabilia from the famous gas station once run by George Preston in Belle Plaine, Iowa. Not to worry — the signs on the station and adjacent garage are not being sold. The station moved to 1301 4th Ave (west end of Main Street, green line on map) in 1921 when the Lincoln Highway’s route was changed through Belle Plaine. 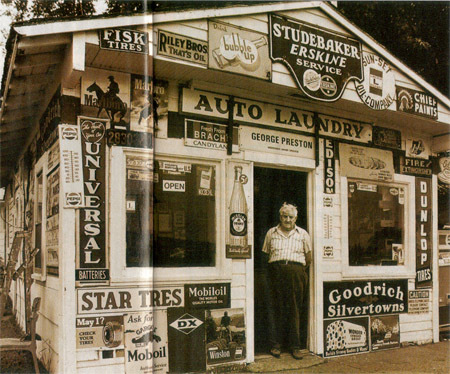 George started working there in 1923 at age 13 and soon purchased the Standard Oil station for $100. It later became a Phillips 66 and remained operational until 1989. George and wife Blanche also operated a 3-room motel. After his passing in 1993, the site was cared for by his eldest son Ronald with the same passion and intuition, and he continued collecting memorabilia until he passed away in 2011. Ron’s daughter Mary Preston wrote to say, “We have no intention of selling the corner but in the same breath we must sell some of the ‘clutter’ on Preston’s Corner.” The family is working with the Lincoln Highway Association and Belle Plaine Historical Society to preserve The Corner for travelers to step back in time. Objects for auction include gas pumps, toys, furniture, books, farm equipment, a 1927 Model T … and lots of signs. 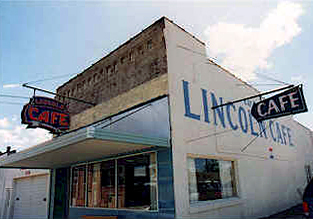 Van & Bev Becker send word from Iowa that the Lincoln Cafe in Belle Plaine is set to reopen in September. The Cedar Rapids Gazette reported today that Gzim “Jimmy” Limani, owner of the likewise famous King’s Tower Café (also along the Lincoln Highway in nearby Tama) is working to rehab the shuttered cafe. When it opens in September, Limani promises home-style cooking every day for breakfast, lunch, and dinner. The previous owner of the Lincoln Café, Curtis Bailey, of Marengo, was murdered in his home last summer and the café closed…. Limani said almost everything like the floors, ceiling and lights will be replaced or repaired and there will be new tables and booths. 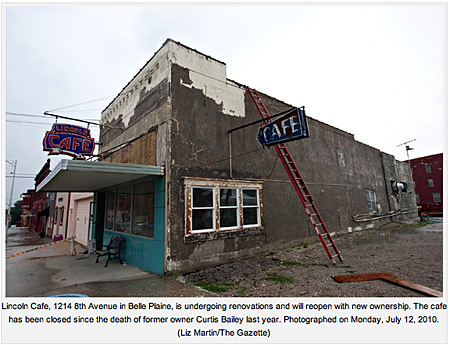 The outside of the café will also get updated with the help of KB Construction in Belle Plaine. Two stories tell two different tales of Lincoln Cafes located along the Lincoln Highway in Iowa. As the murder trial continues for the owner of the Lincoln Cafe in Belle Plaine, Iowa, LHA director Van Becker reports that the well known restaurant still sits idle and nothing inside has been touched for months. Van & Bev Becker of Iowa sent a reminder that it was 20 years ago today that George Preston appeared on The Tonight Show with Johnny Carson to tell some of his endless stores about the Lincoln Highway. March 23: Belle Plaine resident George Preston said he was treated “just like the President of the United States” when he appeared on the “Tonight Show” with Johnny Carson. Known for his entertaining stories of the Lincoln Highway, the 79-year-old Belle Plaine native at one time operated a gas station on the highway adorned with advertising signs from the 1920s and 1930s. Van & Bev Becker wrote to say that Belle Plaine, Iowa, hopes to encourage tourism by promoting the Lincoln Highway and its importance to the town. Artists have been commissioned to paint historic scenes on local structures. The Beckers sent the photo below of a mural on the outside of the history museum at the corner of 12th St. & 9th Ave.
A word about the dates 1913 through 1937 that were used in the caption at the bottom of the mural. The 1913 date is of course of the beginning of the Lincoln Highway; however, the 1937 date includes the early years when the Lincoln Highway was designated as US 30. Early highway planners routed travelers miles to the south into the city of Belle Plaine to avoid the steep and muddy “Bohemie Alps.” By the late ’30s, highway building techniques, including cut and fill, allowed the then-Highway 30 to run straight west through the extremely hilly region east of Tama, resulting in Belle Plaine being bypassed. This new route straight through the Bohemie Alps is the road you will drive today if you follow Highway 30 between Cedar Rapids and Tama. So the mural portrays the 1913 route through the terrain it was, in reality, avoiding. According to the Cedar Rapids Gazette, Curtis C. Bailey, co-owner of the Lincoln Cafe in Belle Plaine, Iowa, was murdered Sunday by his common-law wife and two other people, reportedly her son and his girlfriend. LHA director Van Becker sent the photo and alerts us that the story was reported yesterday on Cedar Rapids KCRG-TV 9 and this morning in the Gazette. The 2nd Annual Iowa Lincoln Highway Motor Tour has been set for August 28-30, 2009. Featured stops along the west-to-east tour will include Desoto Bend, Carroll, Jefferson, Boone, Nevada, Marshalltown, Tama, Youngville, Cedar Rapids, Mechanicsville, Lowden, and Clinton. ABOVE: George Preston’s station, Belle Plaine. Photo from the Iowa Lincoln Highway Association site, by Bryan Osberg, Urbandale, Iowa. The tour is open to any make and model car, though a good many classics show up too. Registration is $20 per vehicle for Iowa LHA members or $30 per vehicle for non-members (includes a 1-year membership to the Iowa LHA) Click HERE for the registation form. For more information, contact Iowa LH Road Run coordinator Jeff LaFollette at jefflaf@peoplepc.com/.